Unbeaten Japan : Experience The True Nature Of Japan! We operate tours into the deep countryside of the Kansai area of Japan and provide opportunities for international visitors to experience localities up close by arranging a variety of options from which to choose. We coordinate & cooperate with established providers of fun & adventure in the local areas. Canyoning, shower climbing, canoeing, rafting. Snorkeling, scuba diving, paragliding. If we don’t do it ourselves, then we will do our best to get you connected with the people who do. We help you assemble the tour that you want to experience based on the time of year you visit + available destinations + our experience, suggestions, recommendations & guidance. We accompany you all along the way. 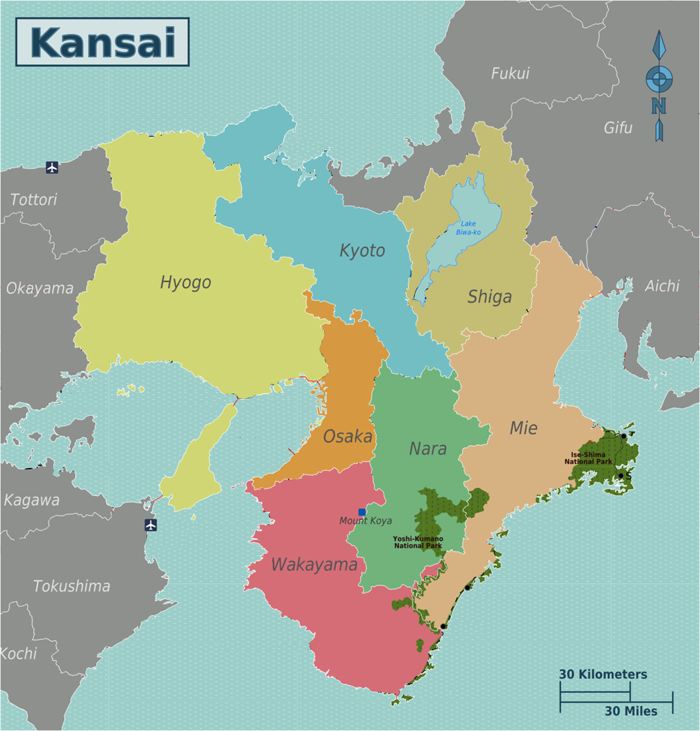 The Kansai region of Japan is also called Western Japan (Nishi-Nihon). The 4 main cities are Osaka, Kyoto, Nara & Kobe — all of which are worth visiting. From there, we head to the outlying areas & countryside, mountains & coasts. As near as 1hr from the Osaka area, or up to 5hrs deep into the neighboring prefectures. The Japan Sea, the Pacific Ocean, the mountains, waterfalls & hot springs of Nara & Wakayama, Tokushima & Gifu. The hot springs & beaches of Okayama & Tottori. "If we don’t offer a certain activity, then we’ll connect you with the people who do." We do not select our destinations based on what is commonly famous or popular. Many of our destinations indeed are far too unique — and off the beaten paths — for ‘regular’ tour operators, and in that regard simply can not be beat. Our rates are far more reasonable than any other tour operator in Japan and we remain unbeaten in this regard. These sample rates below are calculated per person per night based on a group of at least 4 participants. Depending on the season & destination, rates really do start this low! All camping, sleeping & kitchen gear is provided by Unbeaten Japan. When available, also dinner and/or breakfast may be included. Meals are pay-as-we-go and can range from Japanese style bento boxes, to group shopping & preparing together at the camp site, or dining at a local eatery (and any combination of those). Water is in abundance in Japan in all of it’s forms, and as such water is a focus of Unbeaten Japan tours. Rivers, waterfalls, beaches, hot springs hot springs hot springs! In Western Japan it is possible to swim in the Pacific or in the Japan Sea from May until October, and in the cool mountain streams July thru August. Hot spring season is practically all year, so even in the rain or in the snow it doesn’t matter because in Japan there’s always an onsen nearby to beat the chill. Camping nights almost always mean a cozy campfire under the light of the moon and stars. Nights spent at inns mean relaxing in the hot spring, or strolling through a quaint countryside village. And we do not simply take you to beautiful destinations just for you to look from afar & take photos. Jump in (literally) and experience the nature of Japan for yourself! At the most basic, accommodation is camping (in tents! ), which we highly recommend for the closest-to-nature experience. Of course all necessary campgear, sleeping gear & kitchen gear is included. Depending on the destination, there are two completely different kinds of camping experience: proper campgrounds at which it’s possible to meet locals (both Japanese & foreign), walk to many scenic spots, and enjoy lively bbqs, for example, or marine activities like snorkeling, etc. Or, isolated camps at which our group is alone in the sublime serenity of the mountains of Japan—no one but us and Nature. Never worry, however, because Japan is a land of convenience, and there are always luxurious hotsprings located nearby, with all modern conveniences. The other option is accommodation at Japanese style inns & lodges (minshuku & ryokan) which often include a meal or two, unless you prefer to just stay, only. Of course on a multi-night trip it's possible for you to do both, for example, camp one night and stay at an inn another night. And it’s even OK to ‘mix & match’ among members of your group—some experience camping in tents while others lodge at a nearby inn, whichever is preferable to each member—yes, we are THAT flexible. Your comfort is a priority and our focus is on making your total experience as worthwhile to you as possible in the short amount of time that you are able to spend with us. For the most part transportation is via Japan’s vast network of trains. We are train-scheduling & train pass experts. We’ll get you to each of your destinations affordably, conveniently & comfortably—whether you go on your own or with us. There are (too?!) MANY rail passes available now in Japan, however, you don’t have to worry about which to buy or whether it’s even worth it at all because we will advise you. Besides the JR Pass (which is almost never necessary if you are visiting only the Kansai area), there are 3 other passes ranging from JPY ¥9,000~¥19,000 per person for 5~7 days travel that include lots of great destinations that you will want to visit, like Hiroshima, Kurashiki, Okayama, Himeji, Kobe, Nara, Kyoto, Osaka, Nachi Falls (Wakayama), Ninja town (Iga), and many others. You are not tied to any pre-determined round-trip type itinerary." We know that many international visitors to Japan travel around by train and after their trip with us often they do not want (nor need) to return to their original point of departure. Nor is it necessary for you to start or finish the experience in either downtown Osaka or Kyoto city. It is more common for us to pick up trip participants at a local station in the countryside, spend a night or two camping & enjoying nature, and then drop them at a different train station that is more convenient for them to continue the next part of their journey—that’s how flexible our services are! In other words, you are not tied to any pre-determined round-trip type itinerary. You have complete freedom & flexibility, thereby allowing the maximum amount of time for you to enjoy your entire stay in Japan, from beginning to end. Contact us before you even book your flights—or before you even decide when exactly you want to visit this great country. We can help you every step of the way with suggestions based on season, climate & other conditions influencing your favorite activities. Start with the kind of nature you’re most interested in. Browse the photos on our website: beaches & coasts, waterfalls, streams & swimming spots, hot springs & mountainscapes, etc. Consider the type of activities you'd like to experience: swimming, snorkeling, hiking, bbqing, etc., or something from a private facilitator, like scuba diving, shower climbing, paragliding, etc. How about cultural activities, when possible? Let us know what you’re interested in, and we’ll recommend the destination(s) that are best for you and suited to the season that you’re able to visit. Fill out the Inquiry Form on the website & we'll get back to you ASAP with some ideas & suggestions, sample rates & plans, etc. Most people visiting Japan want to see at least a few of the more popular touristic destinations, and we can assist you with that part of your plan, as well. We understand that visitors are in the Kansai area usually for just a short time—a week or less. However, give us as few or as many nights as you feel you can afford—timewise, financially—we guarantee you won’t regret it! We work with you as much or as little as is necessary for you to feel completely comfortable & satisfied. A trip with us out into the REAL nature of Japan is a rare experience. Some of our destinations are so secret & secluded that not even Japanese or foreigners living in Japan know about them. And even if a destination that we visit is popular or known, we determine when is best to visit, what’s best to do there and how best to do it. Our nature destinations can be combined with a variety of common & well-known tourist spots. Are you interested in visiting the islands of Kyushu and/or Shikoku? How about the cities of Hiroshima, Kurashiki/Okayama, or Himeji? Have you heard of Tottori? Kinosaki? Amanohashidate? 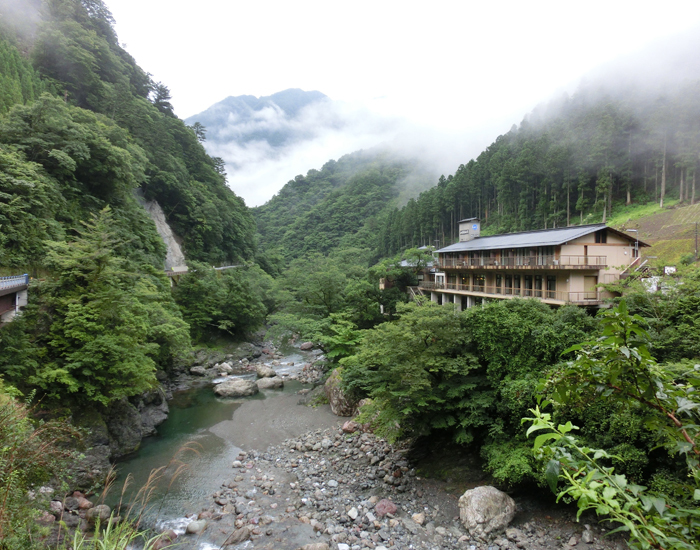 Do you have Koya Mountain, Kumano-kodo or Nachi Falls on your list? Let us take you to places off the beaten paths!